Recently, several Bollywood actors have been roped in by motorcycles manufacturers, like Aamir Khan by Mahindra 2-wheelers, Salman Khan promotes Suzuki Hayate, while Akshay Kumar has become the ambassador for Honda Motorcycle & Scooter Ltd. But it was quite a shocker to spot Shahrukh Khan astride the much anticipated 2012 Bullet Thunderbird 500cc during the shoot of Yash Raj film's forthcoming romantic flick, with leggy actress Anushka Sharma as pillion. So is SRK joining the bandwagon to promote a two-wheeler manufacturer or is it another one-off publicity gimmick by the company to create some hype around the 'to-be-launched-soon' bike? Whatever it might be, the trick seems to be working. 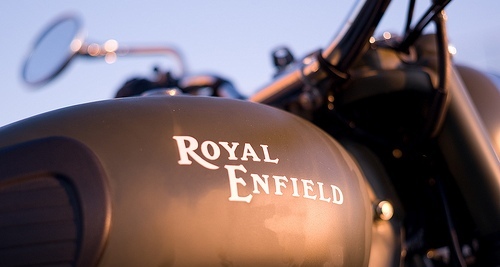 Though the new Thunderbird was revealed by Royal Enfield during the 2012 Auto Expo in New Delhi, several spy pictures of the bike have been doing the rounds online recently. This indicates that the launch is due soon. There's enough buzz around the new Thunderbird already, so can we please have the bike now?